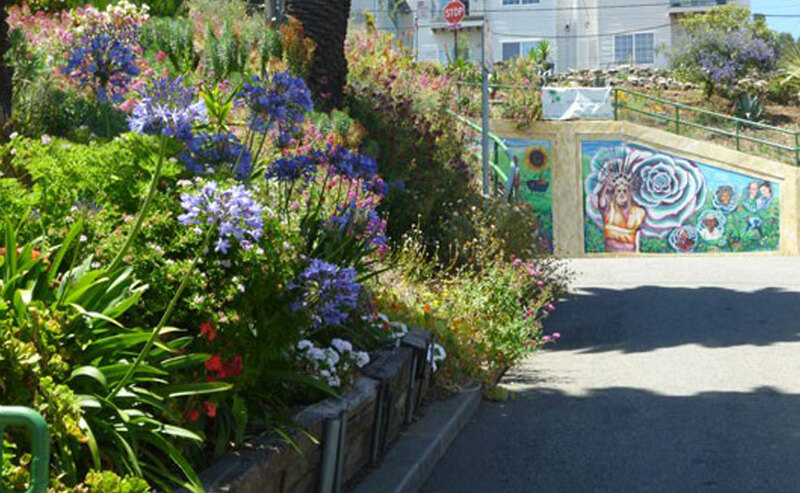 In 2006, San Francisco Beautiful recognized Quesada Gardens Initiative with a Beautification Award. This block of Quesada in the Bayview is a postcard San Francisco street. On a hillside, its two narrow traffic lanes are separated by a sloping median. It should have been idyllic except for its proximity to 3rd Street in the heart of the Bayview that for years, has been awaiting economic improvement. The block was almost devoid of plant material. Litter and debris dominated the median. Instead of complaining to City Hall, residents began to improve their block one flower at a time. The outcome is impressive.